The Last Detail is the most recent work of Lisa J. Lickel and while billed more as women’s fiction, it has a nice romantic thread to it. Merit is a medical missionary who is injured on the field and sent home to recover. The only problem is, the mission board refuses his request to return to the field. Cast adrift and trying to figure out what to do with his life, he moves into a large empty home that is an inheritance left to him and his sister. While struggling with his value and direction, he is intrigued with Amalia who has taken on the task of managing final details of the estate that the house is a part of. 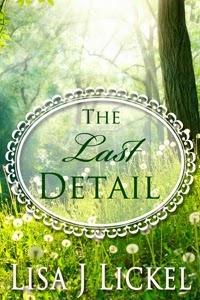 Amalia runs a business called The Last Detail, (hence the name of the book), that helps people with other end of life planning beyond the funeral. She is stuck in a relationship with the funeral director, Hudson, who assumes they will marry. Can Amalia break out of her rut and embrace a larger life than the one that had been prescribed for her by her parents and business associate? Perhaps one that takes her beyond the borders of her city? Both characters have to struggle with their relationship with God and with each other as obstacles continually emerge to confuse and complicate their lives. I don’t want to give any spoilers away! Just read the book and enjoy the story as it unfolds. This is a well-crafted story that has hung with me for days after reading it. Sounds like I need to get on to my TBR list. I enjoy books that will stay with you days after. If The Last Detail follows suit, it’s a great read. Lisa Lickel is a wonderful author. I obviously agree with you. 😀 Blessings! Thank you for stopping by, and your comments. I’m grateful.